Source: Produced in insect cells. Recombinant soluble BACE2, cloned from human cDNA, secreted as zymogen from insect cells, purified using a C-terminal His-tag, and cleaved to the mature active form. Produced in a baculovirus expression system. Formulation: Liquid. In 50mM TRIS-HCl, pH 7.5, containing 100mM sodium chloride and 20% glycerol. Specific Activity: ≥20 U/µg enzyme. One unit will hydrolyze one pmole Mca-KPLGL-Dpa-AR substrate (Prod. No. BML-P276) (10µM) per minute at 37°C, in 50mM NaOAc, pH 4.5, 1M sodium chloride. Application Notes: Useful tool to study enzyme kinetics, cleave target substrates, and screen for BACE2 inhibitors or BACE1 inhibitor selectivity. Use/Stability: BACE2 is stable after 5 freeze-thaws at 0.3-0.4 µg/µl; freeze-thaw stability of more dilute preparations has not been tested and could lead to loss of activity. 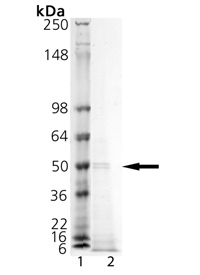 Scientific Background: BACE2 is an aspartic protease found in both transmembrane and soluble forms. It is related to, and possesses an overlapping substrate profile with, BACE1. It is likely involved in Alzheimer’s disease, and implicated in other neurological, pancreatic, and muscle pathologies.